The Getty Research Institute harbors an artisan’s recipe book for dyeing wool, ca. 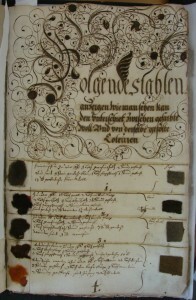 1680, with supplementary papers that date from 1653-1762. The book contains 135 leaves, it is illustrated, and it is written in German. What is particularly interesting is its internal structure: this book is arranged alphabetically by the names of colors, and it contains the original samples of dyed wool. “Each section is ornamented by large calligraphic initials and there are other watercolor devices and drawings throughout. The first part of the volume contains recipes for making grey, blue, yellow, orange, red, purple, brown and black, with dyed samples of raw wool affixed by means of red sealing wax. The second and third part of the volume contains recipes for dyeing felt and woven wool cloth, with samples. The manual was probably used in a shop producing and selling heavy woolen cloth for cloaks and overcoats.” Also contained in the volume is a recipe for black ink which will not fade, 1682, and instructions on how to play the lute, with musical scores included (there is a musical scholar interested in exactly this question: when and where are musical scores integrated in recipe books? Please do let us know about other examples). 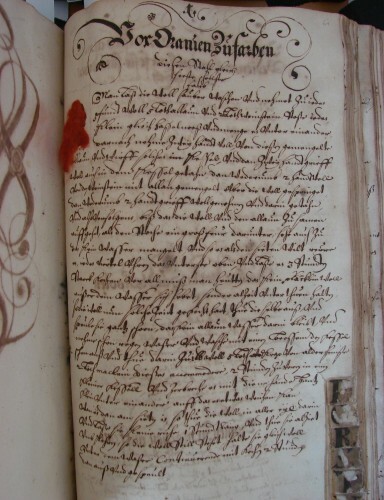 Miscellaneous papers include an example of calligraphy, two bills for herbs used in dyeing, 1677, 1679, and genealogical papers and correspondence of the Brinck and Zillessen families of Gladbach, 1762, who were still in the textile dyeing business in 1908. The torn front page conveys the fragments of the compiler’s name (“Abraham Dederix”) and the date (“Anno 1653”). 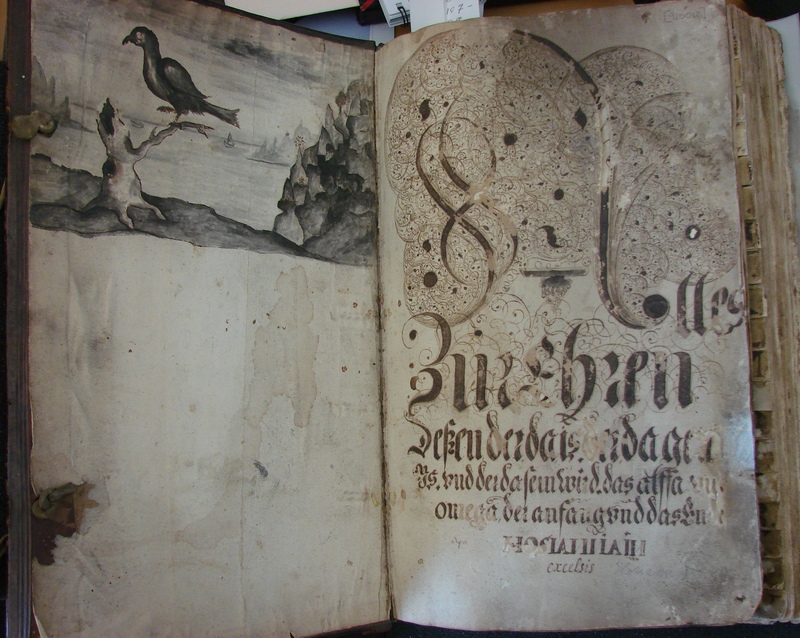 From the start of the book, a black raven features in an elaborate, though amateurish illustration. This motif accompanies the reader throughout the book, at some point turning into an allegory of “autumn” (“Der Herbst”) itself, close to an instruction on “How to dye ash color” possibly indicating an alchemical interpretation of color generation and chromatic change that ranges between black and white (fig. 2). This drawing is accompanied by a depiction of two pilgrims wandering through a bleak landscape and an inscription linking to the expectation of death and the day of the last judgment (“Jüngste Tag”). 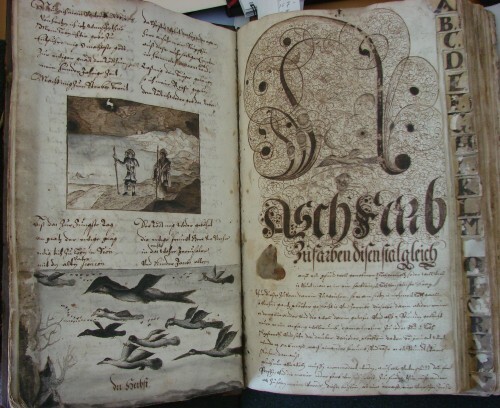 The book itself is compiled “Zur Ehren deßen, der da is […], und der dasein wird das alffa und omega, der anfang und das Ende. Hosianna in excelsis“ („In honour of who is […] the alpha and omega, the beginning and the end. Hosianna in excelsis”) (fig. 3). 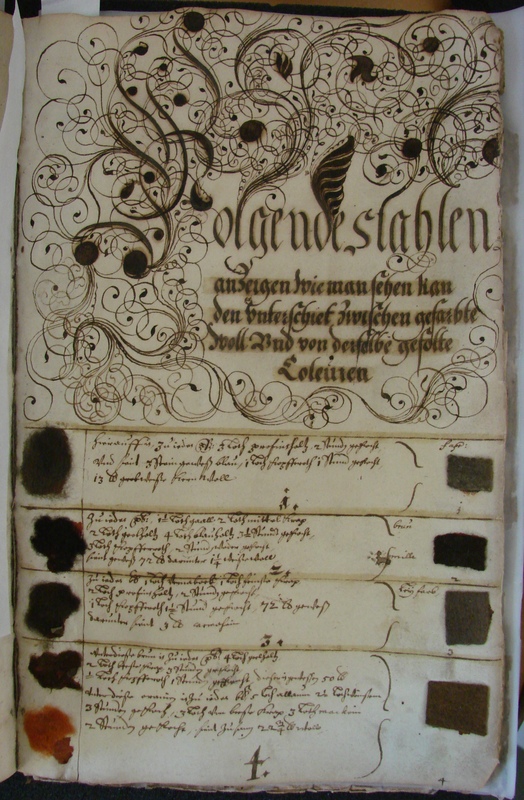 An alphabetical register, cut into the pages, structures the entries throughout, so that several pages remain blank, while others convey not only detailed instructions on how to achieve specific colors in wool dyeing but also contain original samples – many of them have kept their original freshness, as can be seen in the example of “How to achieve orange color” (“Vor Oranien zu farben”, fig. 4). Most interesting are entries that demonstrate the change of color hue and saturation w hen textiles are dyed for one, two, three or four hours respectively (fig. 5). 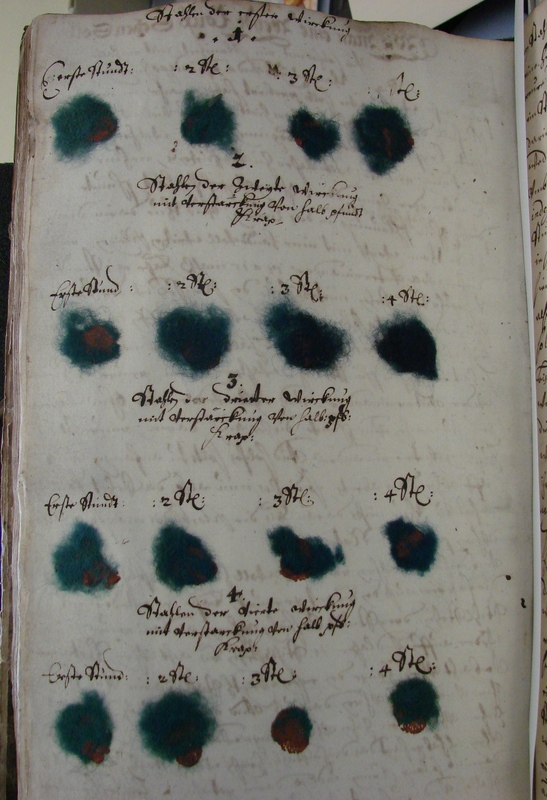 Additional papers supply a list of herbs and plants used as colorants, with their names listed both in German and in Latin. A crucial next step in studying the manuscript would be to organize art technological tests of the samples and then compare the results to the information about the ingredients and chemical instructions provided by the recipes themselves. All images in this post are taken from Getty Research Institute Library Manuscript 910012 ‘Artisan’s recipe book for dyeing wool, ca. 1680, and other papers, 1653-1762’ and are reproduced with kind permission from the Institute. See the entry in the library’s catalogue. What a wonderful book. I especially love the samples, since they show how people adored colour back then – one tends to think of the time as sort of muted and drap, a lot of brown in different shades. That orange colour is a real kick! What an incredibly exciting post! I’ve been researching pre-1800 dyes and textile cleaning technology for a long time, including translating renaissance German dye recipes and experimenting with the recreation of the recipes themselves. The late 16th and 17th centuries were such a pivotal time for the dye industry, with the influx of New World and exotic dyestuffs into Europe. 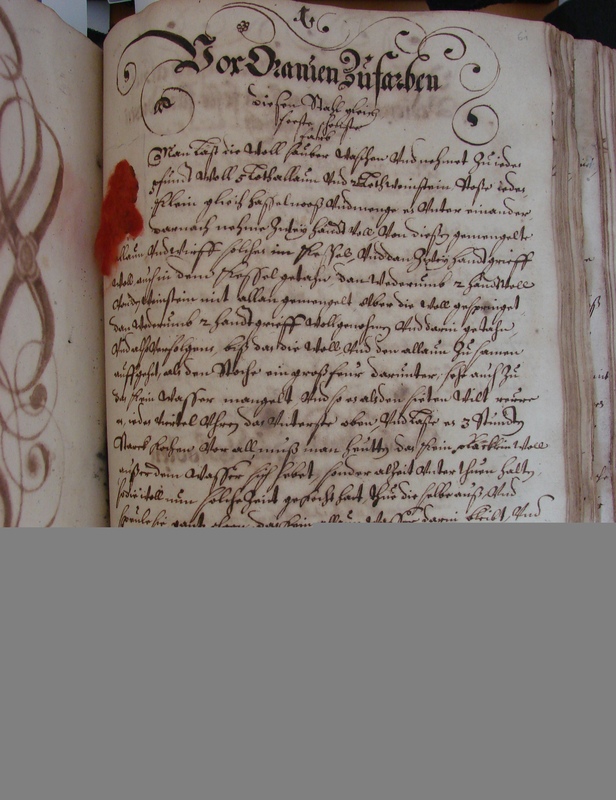 Do you know of any plans to transcribe the German text? Also, do you know if this text is available for viewing in the Special Collections reading room? Are there plans to publish an English translation? She applied several different tests, including changing mordants and time durations. Are there any plans for making the recipes available online or in book-form? It would be a great resource for natural dyers. I so much would line to “get in touch” with a copy mm of this blok.